A short way into the holiday trek to Barnard Hut, with Christy towing the main course. We’re always game for a hut trip. 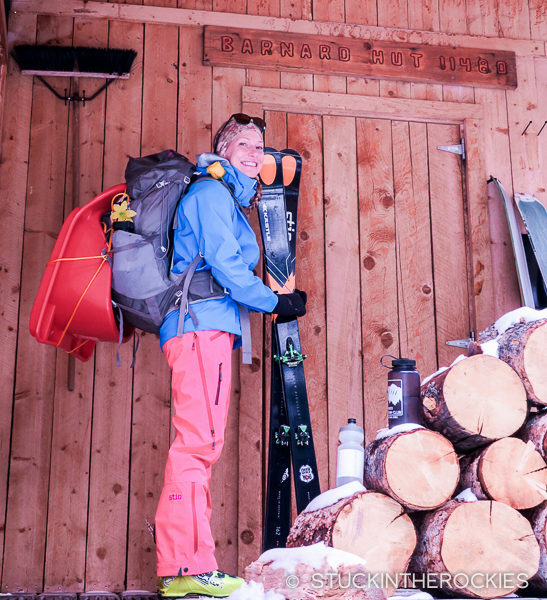 Early season, late spring, summer, holidays… there’s never a bad time to head out on one of these adventures. Thanksgiving is no exception. Sure, some people don’t think it’s practical to arrange a Thanksgiving dinner at these hard to reach cabins. At least not one that’s on par with the feast you may be accustomed to at home. We insist that it really isn’t that tough to do. 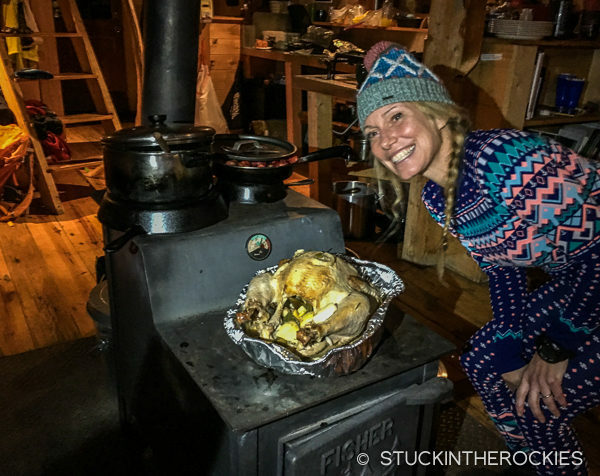 It’s easy to cook at the huts, and a lot of food can be prepped in advance. 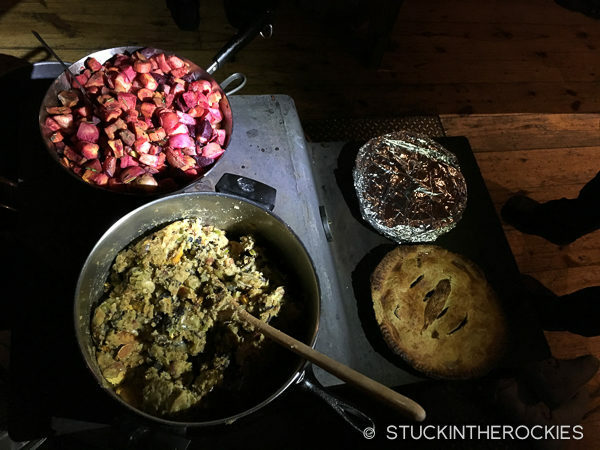 There’s enough room to invite a full table of friends and as anyone who has ever partaken can attest, everything tastes better when you’re out in the woods. That’s not all. 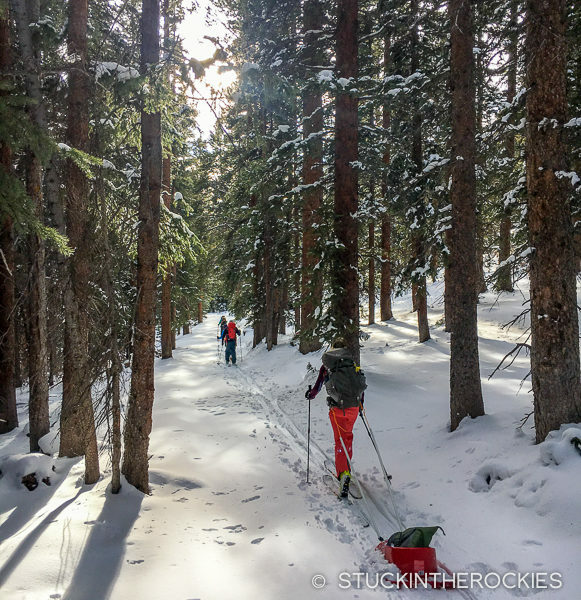 Thanksgiving weekend is when many ski areas in Colorado open for the first time, and while opening day skiing can be fun, conditions on some years leave much to be desired. It’s fun to take a few obligatory runs on the hill to usher in a new season. 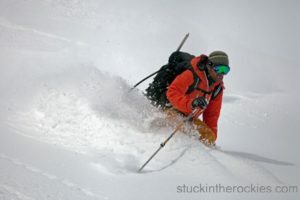 But it’s rare that conditions are that spectacular that you’d really be missing out on anything if you weren’t around. And that was the case this year. 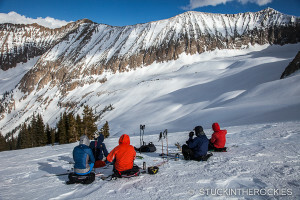 Opening Day on Aspen saw a lot of people crammed on a couple of groomed strips of snow. So it was actually a perfect day to be somewhere else. 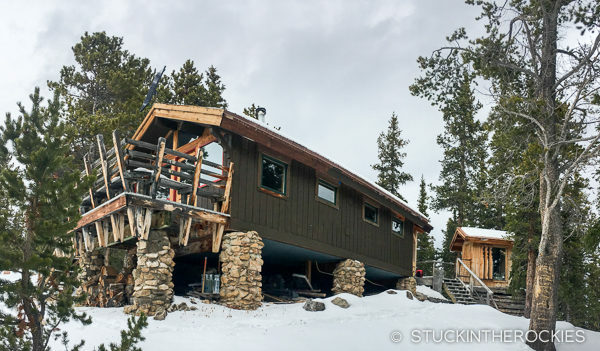 And so in a twist to the “earn your turns” philosophy, we figured we would spend a few hours hauling our own holiday into one of these huts, in an “earn our dinner” kind of way. 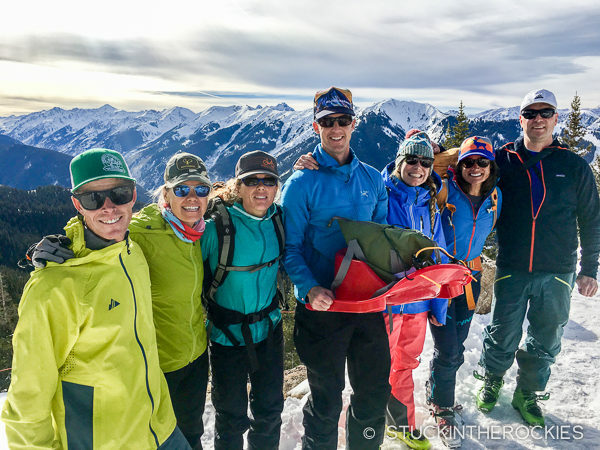 The group and the turkey atop Aspen Mountain, ready to embark on the seven mile trip. This year we booked the Barnard Hut, in the Braun Hut system outside of Aspen. This hut is unique in that it isn’t accessed from a low trailhead like so many others. The route to the hut starts from the top of Aspen Mountain. So the adventure actually begins with a 15 minute gondola ride to the 11,200 foot summit of the ski area. From there it’s a seven mile rolling skin along the Richmond Ridge jeep road to the hut. That worked out really well for us because it’s been a very lean year so far in terms of snowfall. The high starting elevation meant we could be on the snow the entire time and we wouldn’t have to walk on any dry trail at all. 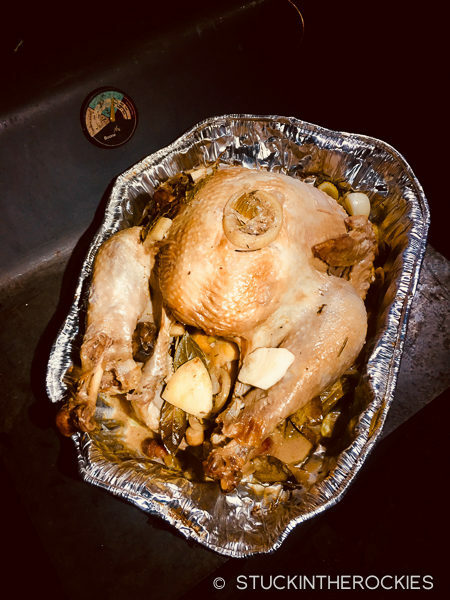 The consistent snow cover was appreciated, because this year Christy insisted on hauling a whole, just-out-of-the-oven turkey into the hut on a sled. Cresting the hill atop Little Annie’s Basin with the 14 lb. cooked turkey in tow. 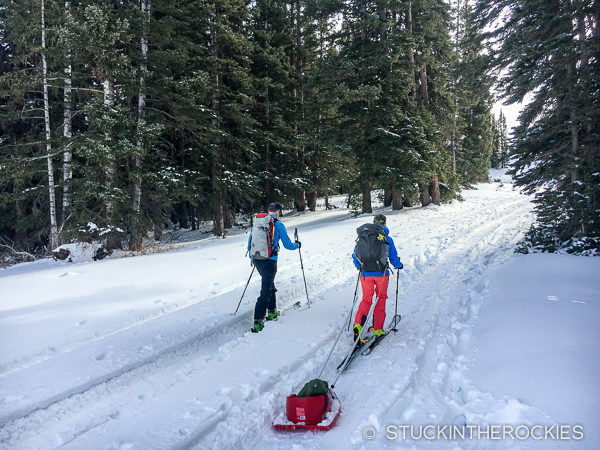 So seven of us loaded the gondola with our skis, backpacks, and one sled with a whole cooked turkey strapped to it and headed out to Barnard Hut. What a way to spend Thanksgiving! By towing the turkey the entire way, Christy figured she earned seconds, or dessert, or probably both. 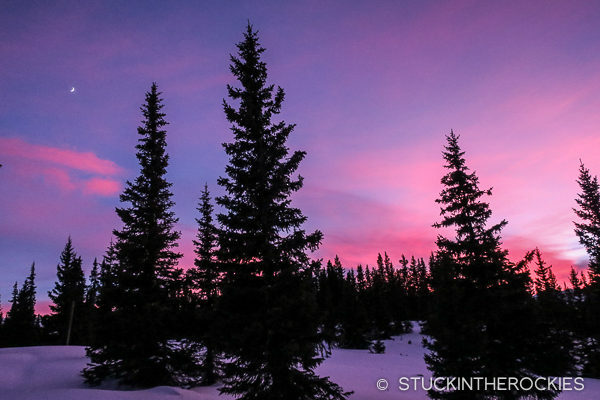 We caught a crazy sunset as we neared the hut. Once at the hut things heated up quickly on the wood stove. The chef, happy with the results. 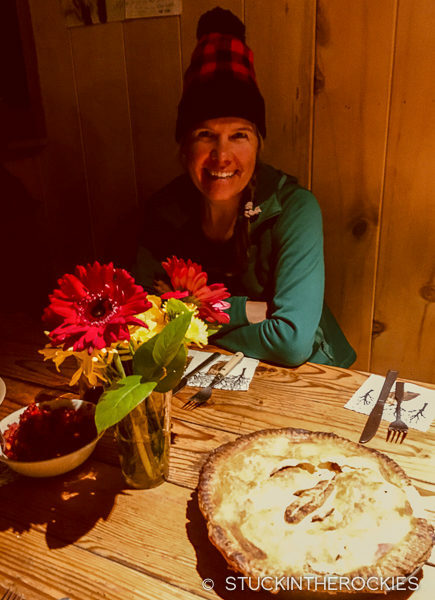 Lissa, with one of Tim’s now-famous apple pies, which made the trip intact as well. 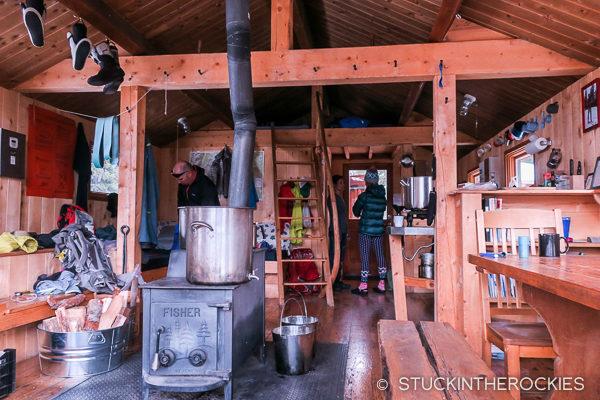 The hut holds eight and is a pretty comfortable, single floor layout with a small loft. It had been a few years since we last stayed here and it was great to see it again. The outside view of the hut, just for some perspective. 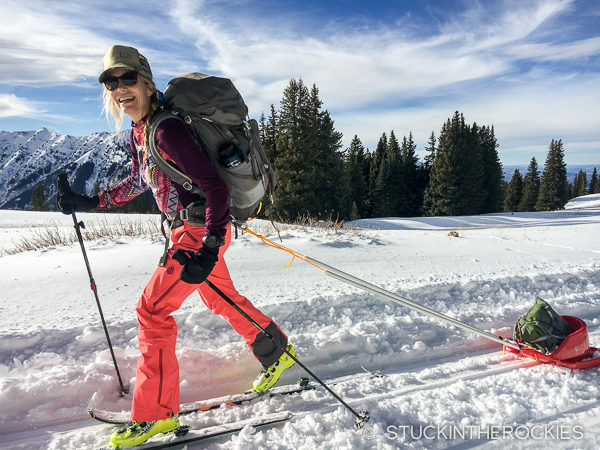 There wasn’t much snow for actual ski touring, so the following morning we relaxed with some leftovers, tons of coffee, and then we packed up everything and the sled and headed back to town. Happy Thanksgiving!! Excellent post, as always, but I’m glad I wasn’t in the gondola cab that you vacated after carting up the turkey. There must have been a fowl smell in there. Looks/sounds like a great day, Happy Thanksgiving. Awesome, guys! Looks like a great time. Without World Cup races and good snow on the front side it was a perfect time to get away. 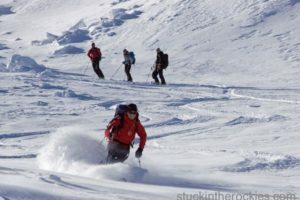 This looks like a ball and a great excuse to get my wife into ski touring. Robert, the sled was just a kids sledding sled we picked up at ACE Hardware. It fit a turkey perfectly with little room for anything else. We bought some PVC tubing to use over the cord in hopes of keeping the sled from sliding down over Christy’s skis on the downhills. Definitely not the same as a well-built pulk. The one thing about Barnard Hut is that the route sees a lot of snowmobile traffic through the season and there are a lot of whoopty-do’s which are annoying at times and sometimes don’t make for towing a pulk all that fun either. I think all huts trips are fun, if you’re not sure about Barnard Hut consider one of the other local Braun Huts. Markley Hut for example is only two miles from the trailhead and you could tow or backpack your gear in there easily.